I’ve never been a big fan of resin so this project didn’t really appeal to me. I thought it would be pretty easy – how wrong can you be? It took me three go’s to get a pass on this one. Here’s the story…. My first attempt was Kokopelli. I first came across Kokopelli on a visit to Sedona in Arizona. 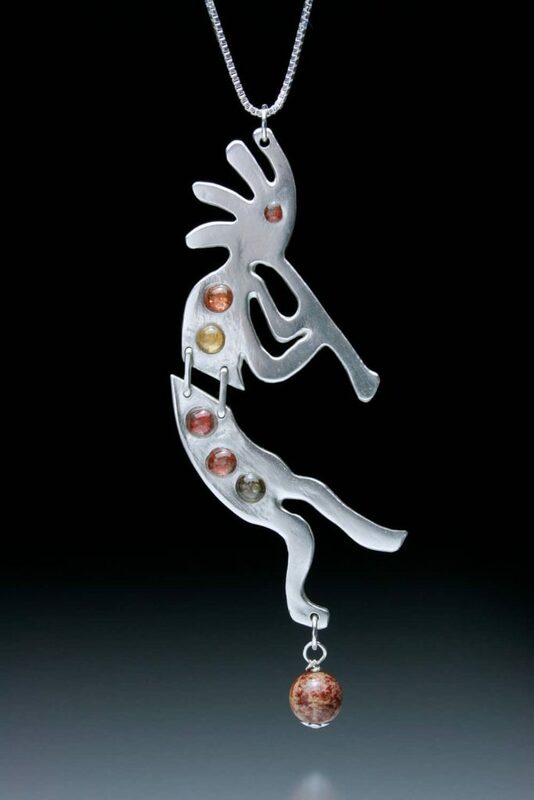 Kokopelli is considered to be an icon, deity, symbol and god, representing fertility. He’s a flute playing character and I saw very old cave paintings of Kokopelli so the symbol goes back centuries. I thought this would be a good subject for a pendant with resin inlay so I made a simple flat pendant, cut it in half through the middle and punched some holes down the spine of the piece. 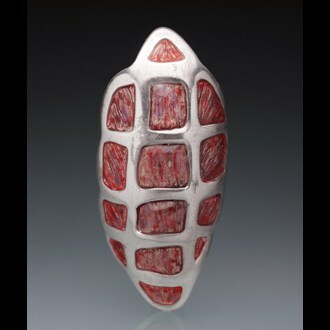 I connected the two parts together using staples of sterling silver and inlaid the resin in a plique-a-jour type format. I used earthy colours to go with the spirit of Kokopelli. I added a brown jasper bead to the bottom and was pleased with the piece. The assessors really didn’t like it though and it was unmarked – it was that bad! The comments explain their thinking. “This piece is a big problem for me. The cookie cutter flat piece is a poor use of metal clay…. A piece like this would be better made by sawing from a flat sheet of sterling. Someone working at this level of metal clay should know this.” Whoa! That told me…it goes on. “This is a poor use of resin. Why would a character like this have blobs of color anyway. These look like the buttons on a gingerbread man. They only hint at the color possibilities available with resin.” This is fair comment I suppose although asking why he would have blobs of colour seems a strange question to me. Why not? It’s decoration. So this one was an abject failure. So I tried again! The next piece was a bracelet and I decided to look for inspiration closer to home. 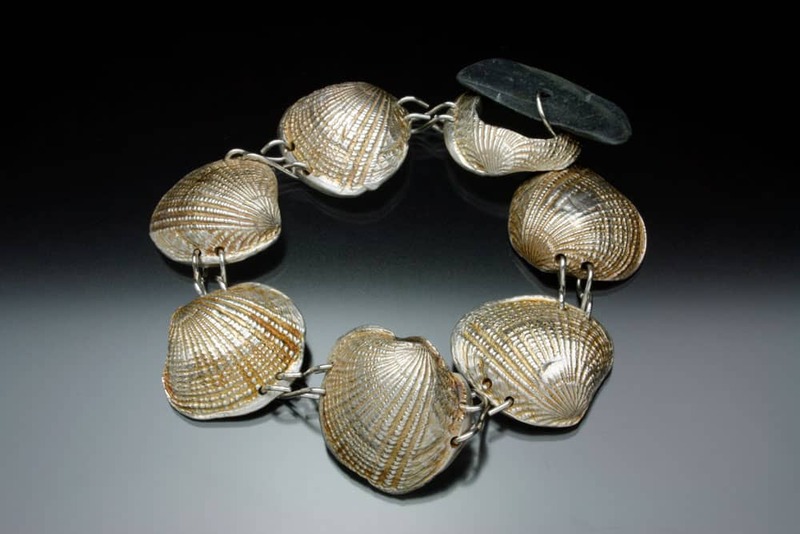 I live near the sea so I decided to make a bracelet using shell forms. I made a shell mold, then pushed the metal clay into the mold using the shell itself. This then gave me a two sided shell form for the bracelet elements. I thought some innovative resin inclusions might be things I’d found on the beach. These included sand, seaweed and tiny shells. The catch was a pierced shell and a piece of beach stone and I thought it worked very well. 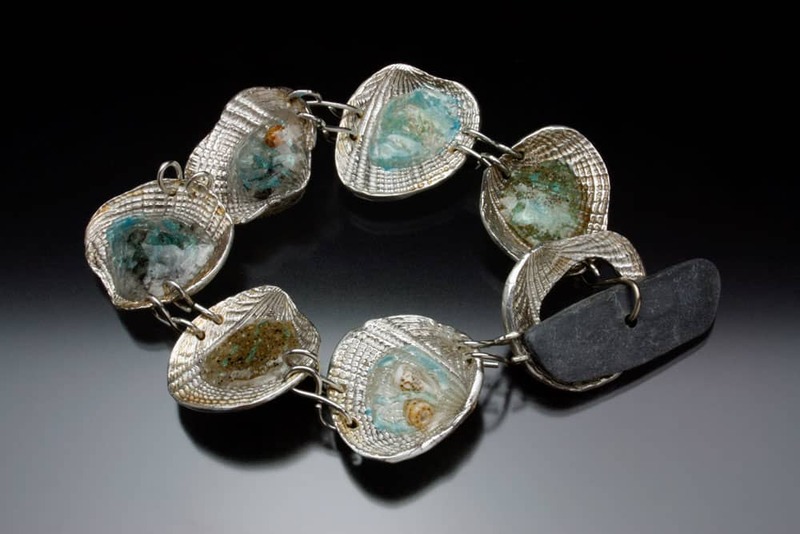 Each shell was joined together with an S shaped piece of sterling. I wore this bracelet quite a bit before sending it and got very good reactions from people so I thought it was OK. How wrong I was! This piece was also unmarked by the assessors. The comments explain. “This piece was not recorded line by line because the scores fell below a certain threshold.” That bad! It goes on to explain further. “There is a lack of clarity with the design and the use of resin. When viewed from the shell side it works visually. The S-hook jump rings need refinement. When turning the piece over I would have loved to have seen wonderful pearls. But I’m greeted with this stuff that is hard to describe.” Oh dear! The final paragraph sums it up. “Combination of ideas and materials seems arbitrary and not thought out. The shells have a canned, commercial quality, the connector S-hooks lack refinement and the rock looks out of place.” So it was back to the drawing board for me. My third attempt turned out to be one of my favourite pieces. The design of the brooch was inspired by the work of Roger Dean, my favourite artist. I love his organic shapes, particularly for buildings and three dimensional objects. This piece was made as a flat sheet, draped over a candle shaped light bulb to make it a long domed shape. This was allowed to dry. The element with the cells was made as a flat sheet and the cells were cut out before it was then draped over the dried form. They were stuck together with a little water. The sides were then cleaned up and filled in. The pin on the back is embedded into tube forms to raise it up as the piece has quite a deep dome. After firing, I used enamel paints to create a multicoloured background and then added clear resin. I was very pleased with the results and so were the assessors. ​Full marks – at last! The comments were all positive. “Overall form is interesting: familiar enough to be easy to take in at a glance, but nuanced with interesting irregularities in the circumference. The doming is sophisticated and gives the piece life. The convex curves are nicely repeated in the resin elements. The color is well handled. There is a clear sense of hue (the red/orange) at first glance, but further examination reveals a whole rainbow of lines in each panel. Excellent craftsmanship and resolution on the back, both in aesthetic and functional terms.” This was really the icing on the cake after two really badly received submissions. ​A wearable piece of jewelry (pendant, earrings, ring, etc.) that uses resin. The inlay can be clear, colored with pigment, or colored with inclusions (brickdust, coffee, paper pulp, etc. ).